Imagine being a US Citizen and being deported to a country where you don’t know anyone? This happened in the 1930’s here in America. In recognition of Hispanic Heritage, this series focuses on the history of immigration and repatriation of Mexican immigrants in the US. 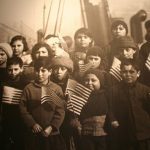 In this two-part series, KBCS’s Yuko Kodama recently spoke with Dr. Gabriella Gutiérrez y Muhs, Professor at Seattle University, regarding the impact of the Repatriation program of the 1930’s. Part 1 – KBCS’s Yuko Kodama and Dr. Gabriella Gutiérrez y Muhs discuss a program in the 1930’s which sent US citizens to Mexico against their will. Part 2 – KBCS’s Yuko Kodama continues the discussion with Dr. Gabriella Gutiérrez y Muhs about the Repatriation program and its lasting impacts on the psyche of the Mexican American community.